These treasures will be highlighted on VanderbiltCupRaces.com thoughout 2017. The story behind the discovery and a few highlights are below. Contractor Roy Knoernschild was asked to clean out the basement of a commerical building in Malverne. Roy discovered this wooden chest hidden in a corner. 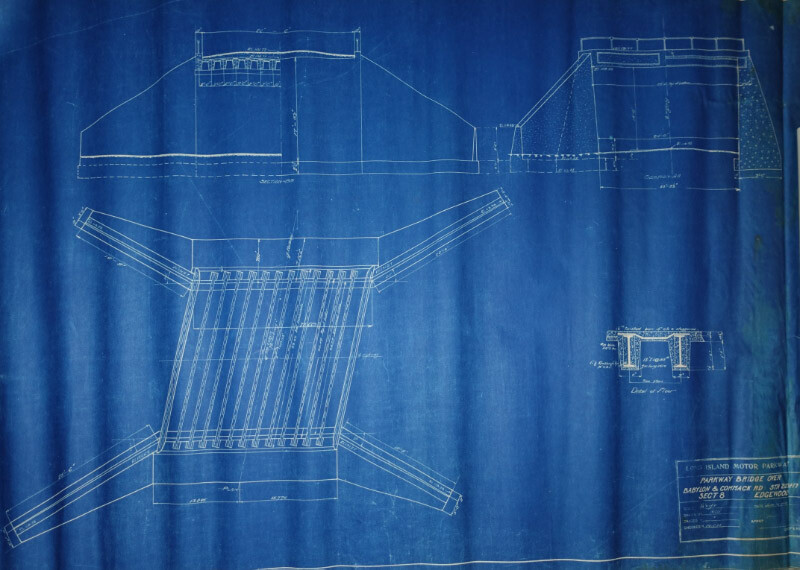 Inside the chest were maps, drawings, surveys and blueprints of the Long Island Motor Parkway. The majority were drawn by Arthur Archibald of Hempstead, New York, a primary surveyor of the Motor Parkway from 1906 to 1938. 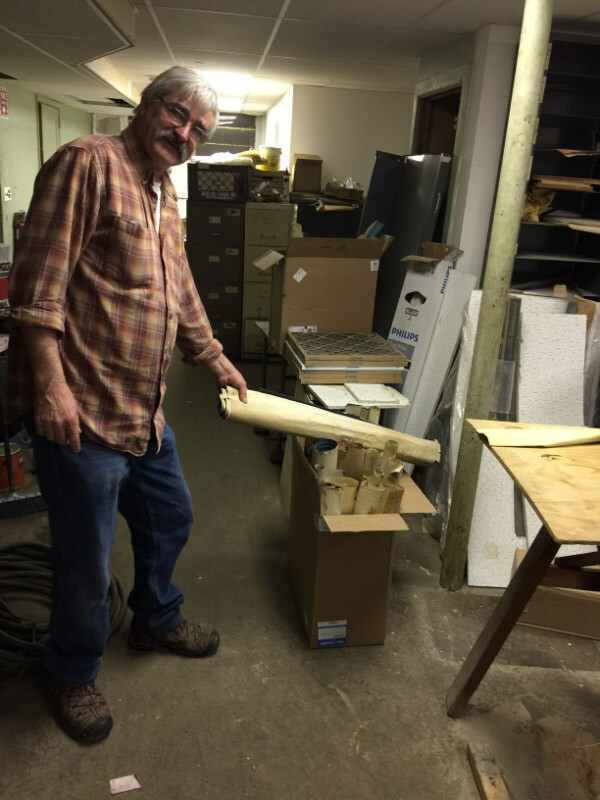 In another section of the basement, Roy found these vintage surveying equipment. 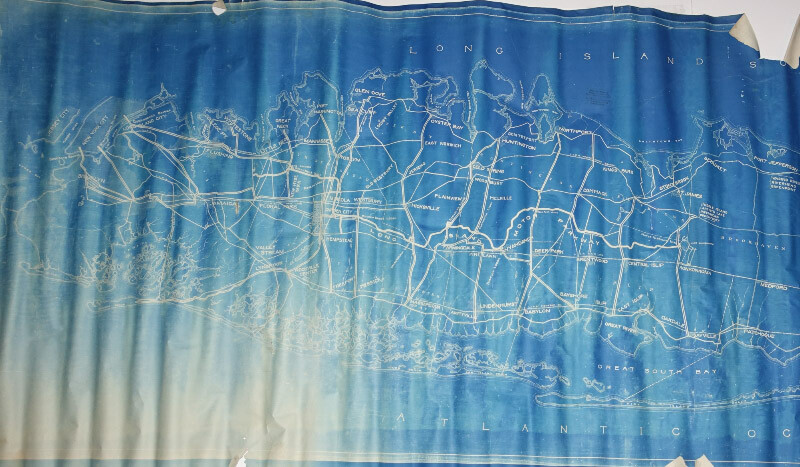 An 11-foot map of Long Island featuring the Motor Parkway issued in February 1908. 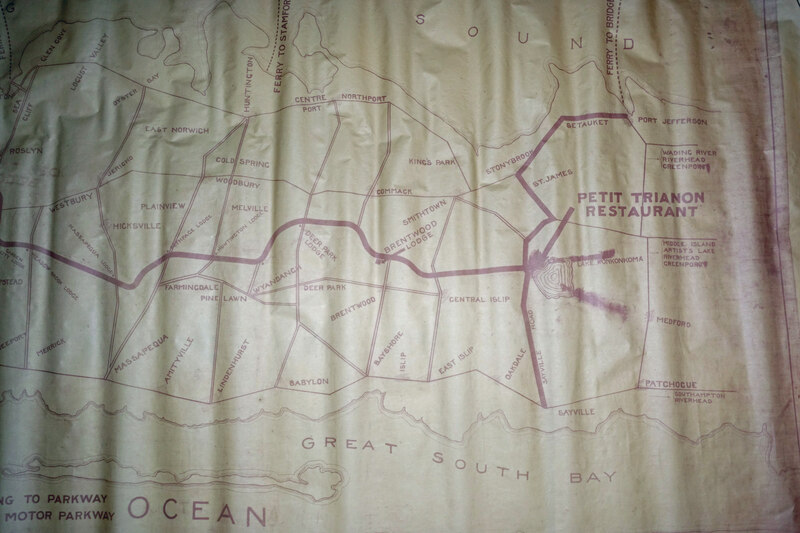 A map showing the roads to Petit Trianon. 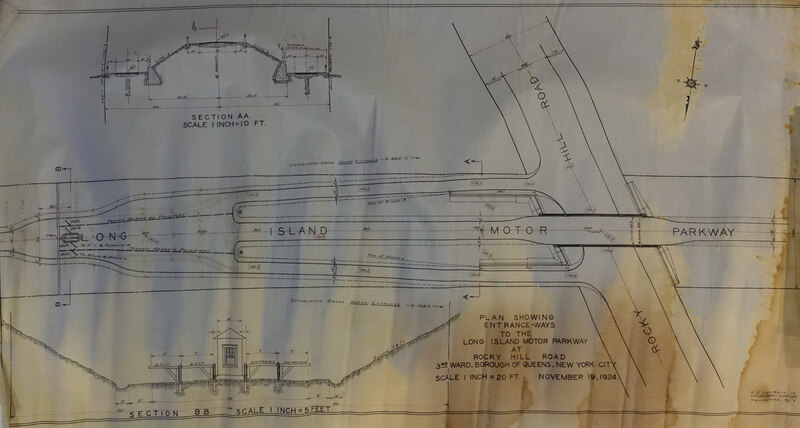 1924 plan showing the entrances to the Motor Parkway at Rocky Hill Road (Springfield Boulevard) in Queens. 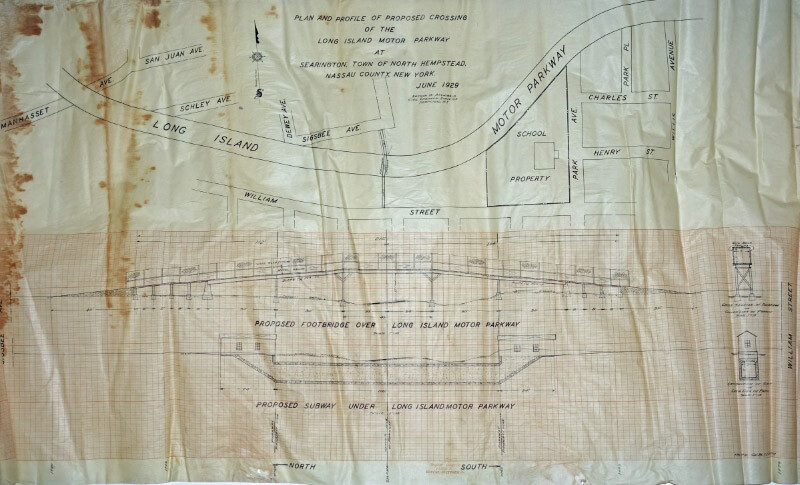 The blueprint for the planned parkway bridge over Commack Road. Survey for the location for the Mineola Lodge. 1924 Map No. One "Parkway crossing the North Hempstead Turnpike". 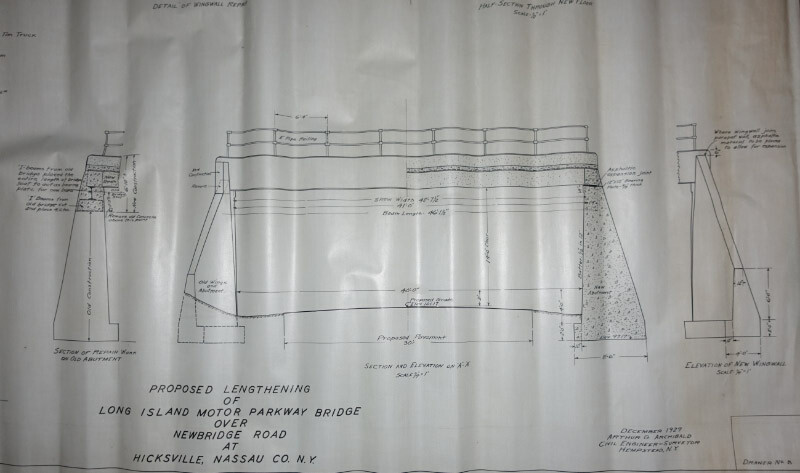 1929 plan to lengthen the Newbridge Road Motor Parkway Bridge. 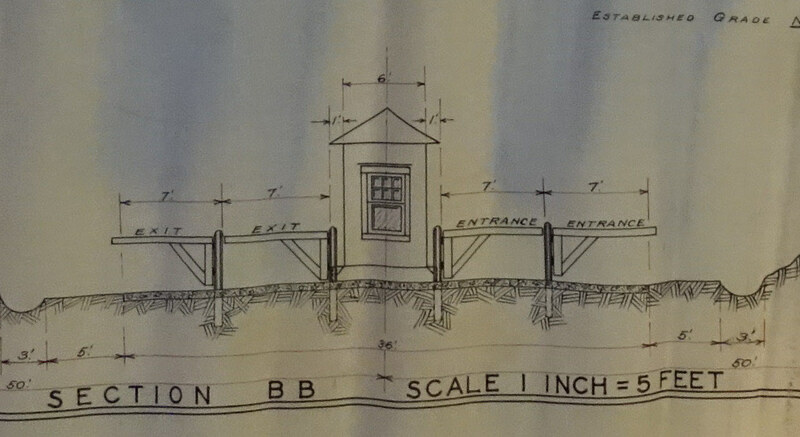 1929 plan for a crossing over the Long Island Motor Parkway in Searington. The plan called for either a proposed footbridge or 'subway". It was never built. Bill, Roy has graciously donated all the material to me with the promise that I will make them available to everyone. Terrific find. How nice that somebody realized its importance and didn’t just toss it into the garbage cans. Howard, So happy for you and posterity! The reason we all “keep at it”... I presume your efforts are so well known in the area that Roy immediately thought of you, or is there more to the story? You’ve scored another grand slam, Howard! Can’t wait to see more. 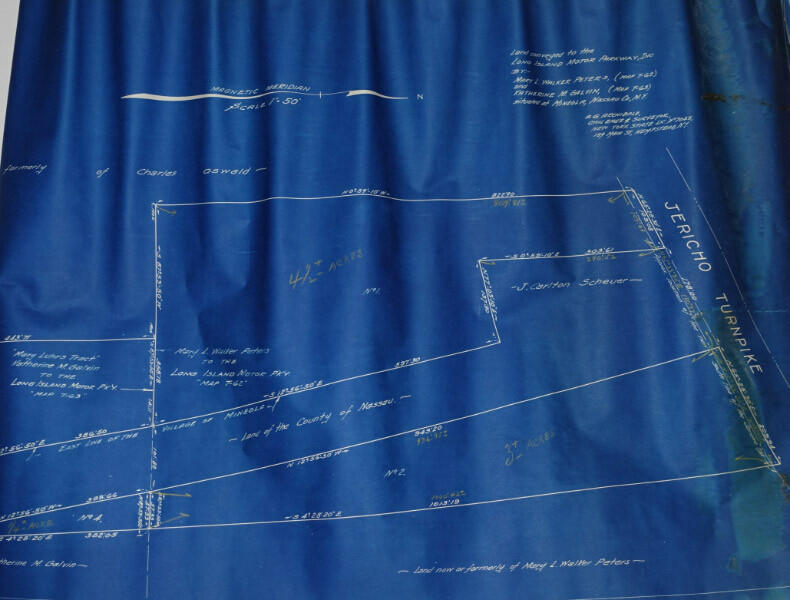 I see the blueprints above for the planned parkway bridge over Commack Rd, but what I could never understand is how the Vanderbilt Parkway crossed Commack Road without disrupting traffic on Commack Road. I live nearby in Dix Hills and drive on both roads every day but there is no evidence of an overpass every being at that intersection, and if there every was, when was it taken down? On a separate note, my wife Lisa and I love your new acquisition, were big fans and always try to say hello when we see your at various car shows. Thanks again, kevin and Lisa. Wow! Very Exciting. Long Island now has its own version of King Tut’s Tomb! Fabulous find! It’s great that Mr. Knoernschild realized their research value and got them to you to share with the rest of us - he really deserves a big thank you from all of us! What I find interesting is that they were in a wood crate sent to Republic Aviation Corporation, Farmingdale from a supplier in Buffalo - I suppose it contained aircraft parts (I couldn’t read all the stenciling on the lid). No doubt, this was meant to happen. Speaking for all I’m sure, we look forward to your future blogs concerning this find; Howard. And I’ll definitely search where a William St was in close proximity to the LIMP. Absolutely terrific find! So generous to make this material available. 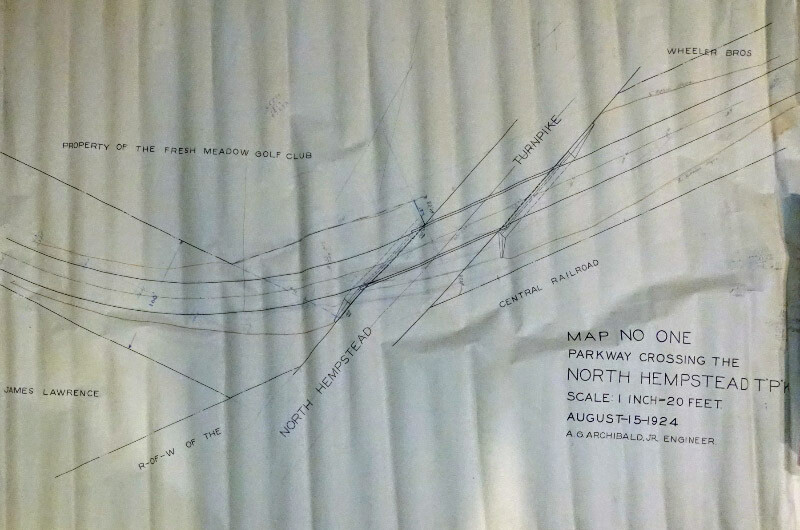 Loved the North Hempstead Tpke Bridge drawing showed Central RR Right of Way! I just realized the last 2 plans involved the underpass/overpass between William St and Sigsbee Ave. Likely for safe passage to the school. This is a fantastic find. Remarkable that after all this time this stuff was still there and in such good condition. Looking forward to more details of these findings. 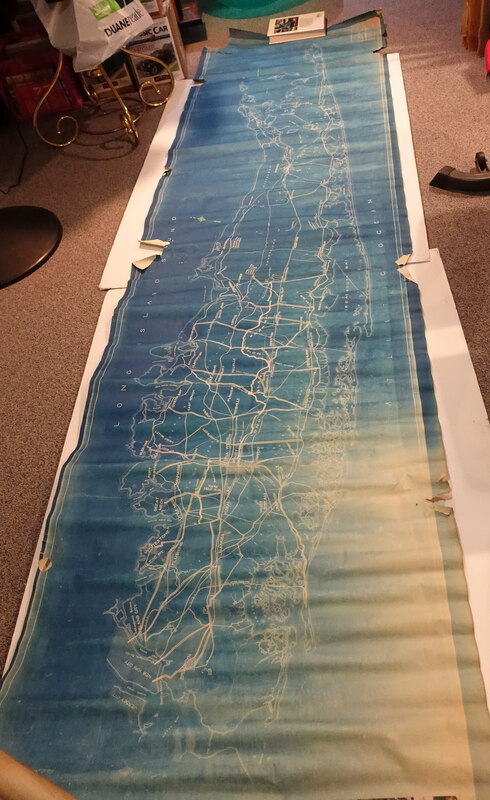 Just another echo, amazing find…..
As others have noted Thank God they were not thrown away! These historic documents are now in good hands. Looking forward to seeing more about them. Yikes! This is gonna be good!! THANK YOU ROY!!!!!!!!!!!!!!!!! This discovery is something Newsday would more than likely be interested in as would community papers in and around Malverne. This is a great story. Just googled Engineering of Arthur Archibald, and saw your article. My mother told me that my grandfather from Nova Scotia was an engineer and was quite inventive. Could this be him? Please respond. Becky, please provide additional information on your grandfather such as where did he live.